The summit clash of the Men’s Hockey World Cup 2018 is set for action as world number three Belgium locks horns with World number four Netherlands at the Kalinga Stadium on Sunday, 16th December. 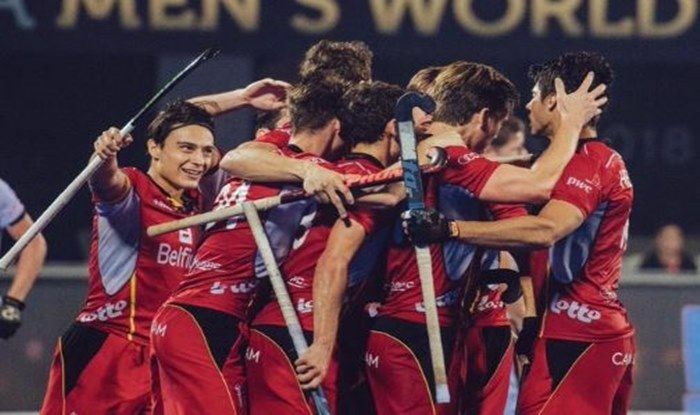 Olympic silver medallist Belgium created history by making their maiden appearance in the men’s hockey World Cup summit clash, thrashing England 6-0 in a lopsided first semi-final here on Saturday (December 15). In the other semifinal of the day, Netherlands held on to defeat Australia in a penalty shootout to enter the finals on Sunday. In the first match of the day, Alexander Hendrickx (45th, 50th minutes) converted two penalty corners, while Tom Boon (8th), Simon Gougnard (19th), Cedric Charlier (42nd) and Sebastien Dockier (53rd) were the other goal scorers for the world number three at the Kalinga Stadium. The players are now warming up, stay tuned for the updates…. The match has kicked-off and both the teams are going all-out attack approach, there has been a flurry of chances at both the end, currently score remains nil-nil. History favours the Netherlands in the fixture, who have an edge of 14-5 in the fixture but so far from what we have witnessed, it could go in anybody’s favour, at the end of the first quarter, the score is nil-all. So far, it’s just difficult to pick one after quality displays from the attacking players, while the defensive players have kept their nerves and kept the chances at bay. Score remains nil-all. The Netherlands were awarded the first penalty corner in the 29th minute of the match but Belgian defence were spot on as they kept the shot at bay. Yet another Penalty corner for the Dutch but another chance is squandered. We are getting closer to seeing the opening goal, it can be sensed and from the Dutch’s side. Although, the Dutch defence will also have to be wary of the counter attacks. Score remains nil-all. It’s half-time the scoreline remains nil-all at half-time, despite very good chances from both the ends. Both teams have to focus on making their chances more clinical in order to convert. The third quarter has begun and so far it has been favouring the Belgian side with the Reds making attempts from the left flank and right flank but to no avail, meanwhile the Netherlands have also had an effort with a counter but it was well defended by the Belgians. The third quarter has come to an end and still there has been no goals from either sides, this has been a very closely-contested match from the very beginning. The score remains nil-all. The two teams have been inseparable at full-time and it’s been a fair result given the number of attacks from both the sides and the strong defensive display by both the nations. There will be Penalties to decide who comes out as the winner in the finals of the Men’s Hockey World Cup. This marks the first time the hockey men’s world cup has gone for a shoot-out in the history of the tournament. Just incredible, both teams remain tied at 2-2 after five penalties. Now, we are into sudden death. The team he gets the next edge wins the tournament. Netherlands miss in sudden death and that makes Belgium the world champions. What an incredible and closely contested match this has been. The match had to go on until the very last stage of ‘sudden death’.